Friends..As you all know, Union Finance Minister Arun Jaitley today (28 February 2015) presented the Union Budget 2015-16 in Parliament. Questions related to this budget will surely be asked in upcoming competitive Exams and mainly in Bank Exams. 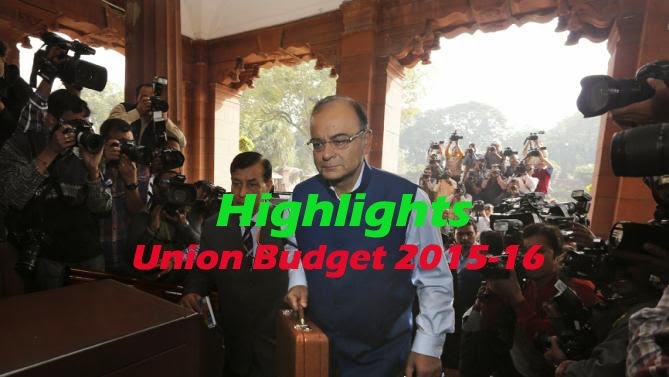 So in this post, we are sharing with you the highlights of the Union Budget 2015-16. --> Incentivise use of credit, debit cards; disincentivise cash transaction to curb black money. * Abolition of Wealth Tax. * Additional 2% surcharge for the super rich with income of over Rs. 1 crore. * Rate of corporate tax to be reduced to 25% over next four years. * No change in tax slabs. * Total exemption of up to Rs. 4,44,200 can be achieved. * 100% exemption for contribution to Swachch Bharat, apart from CSR. * Rs. 25,000 crore for Rural Infrastructure Development Bank. * Rs. 5,300 crore to support Micro Irrigation Programme. * Farmers credit - target of 8.5 lakh crore. * Rs. 70,000 crores to Infrastructure sector. * PPP model for infrastructure development to be revitalised and govt. to bear majority of the risk. * Atal Innovation Mission to be established to draw on expertise of entrepreneurs, and researchers to foster scientific innovations; allocation of Rs. 150 crore. * Govt. proposes to set up 5 ultra mega power projects, each of 4000MW. * AIIMS in Jammu and Kashmir, Punjab, Tamil Nadu, Himachal Pradesh, Bihar and Assam. * IIT in Karnataka; Indian School of Mines in Dhanbad to be upgraded to IIT. * PG institute of Horticulture in Amritsar. * Centre of film production, animation and gaming to come up in Arunachal Pradesh. * IIM for Jammu and Kashmir and Andhra Pradesh. * Allocation of Rs. 2,46,726 crore; an increase of 9.87 per cent over last year. * Focus on Make in India for quick manufacturing of Defence equipment. * GST and JAM trinity (Jan Dhan Yojana, Aadhaar and Mobile) to improve quality of life and to pass benefits to common man. * Six crore toilets across the country under the Swachh Bharat Abhiyan. * MUDRA bank will refinance micro finance orgs. to encourage first generation SC/ST entrepreneurs. * Housing for all by 2020. * Upgradation 80,000 secondary schools. * DBT will be further be expanded from 1 crore to 10.3 crore. * For the Atal Pension Yojana, govt. will contribute 50% of the premium limited to Rs. 1,000 a year. * New scheme for physical aids and assisted living devices for people aged over 80 . * Govt. to use Rs. 9,000 crore unclaimed funds in PPF/EPF for Senior Citizens Fund. * Rs. 5,000 crore additional allocation for MGNREGA. * Govt. to create universal social security system for all Indians. * Rs. 75 crore for electric cars production. * Renewable energy target for 2022: 100K MW in solar; 60K MW in wind; 10K MW in biomass and 5K MW in small hydro. * Develpoment schemes for churches and convents in old Goa; Hampi, Elephanta caves, Forests of Rajasthan, Leh palace, Varanasi , Jallianwala Bagh, Qutb Shahi tombs at Hyderabad to be under the new toursim scheme. * Visa on Arrival for 150 countries. * Forward Markets Commission to be merged with the Securities and Exchange Board of India.